"She was responding to a call, and not from logic or reason. It came from a primal place, from bone and muscle, from childhood sorrows, from lost voices in dreams. It came, she realized from her very blood." When her academic parents are brutally murdered, Shannon discovers that they were part of the radical anti-war movement of the 60s and begins to suspect that their killer’s motive may lie in their past…She soon finds that they were friends of Diana Burke and John Paul West, two of America’s most wanted fugitives, anti-war militants who went underground after a fatal bombing in 1968 and never resurfaced. As I'm smack in the middle of Seth Rosenfeld's book Subversives, which deals with student radicals, the blurb for this book whetted my appetite and I decided I had to read it. 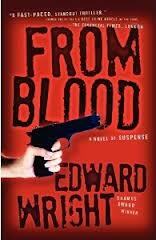 From Blood is a good combination of thriller and suspense that takes its readers on a wild ride from present to past and present again and takes a look back at a time when domestic protest was torn between two fronts -- those opposed to violence and those who felt that violence was a necessary means to producing real change. "You have to find them and...Warn. Them...God, he's so full of hate. We should have guessed...We're giving back the treasure...You're..."
After Mora dies, the police begin their investigation, and in a discussion about what to do with the property their parents left behind, Beth and Shannon decide that they need to go through the less-destroyed garage & take out anything of value they might wish to keep. Shortly afterward, the FBI visits Shannon, and inform her that there may be some kind of connection between the deaths of her parents and a case they're working on. They ask her lots of questions about her parents' student days; she has very little to tell them. But going through the garage and then her father's locker at the university where he works, she stumbles across photos and other things that may shed some light not only on her parents' murders, but also on why the FBI is so keen on questioning her. As she's trying to make sense of it all, a woman Shannon had first met at the memorial service for her parents shows up and demands to know the whereabouts of Nadja and Ernesto, and threatens Shannon with bodily harm if she doesn't give up the information. Obviously, the FBI isn't the only one interested in the Fairchilds' past; as Shannon delves deeper, she embarks on a journey that will send her back to that fateful night in 1968. But, as she soon realizes, she's not alone in her quest. While thriller/suspense novels normally aren't my cup of tea, From Blood got to me right away and kept me prisoner because I just couldn't put it down. I am fascinated with anything focused on the turbulence on the home front during the Vietnam War, and it's very obvious that the author did quite a bit of research before putting this book together. I'm also very much interested in the lives of people who had to drop off the map and go underground, and the author is very skilled at creating lives for his characters who underwent that experience in his book. He also has this way of building tension that just doesn't stop so that putting the novel down just doesn't seem to be an option once you've started it. Let me also point out that I was just positive I'd figured out the "who" and was totally wrong on that score, so that's a definite plus. On the flip side, even though I really liked this book, it's one that requires you to set your suspension-of-disbelief factor to high, a move that seems to be prerequisite to reading any kind of thriller/suspense-type novel. This isn't the case in every scene, but there's one character, Diana, who's just too over the top to be credible. The ultimate question of the "who" seems perfectly logical to me, along with motive, but credibility went way down in terms of the final, climatic scenes set in Seattle with a deus ex-machina experience that while kind of exciting, made me actually groan inside. And then there's that final chapter, which, unlike the tone the author set in the rest of the novel, came out sort of sappy and out of place. Considering that I don't normally choose this genre of books as my routine reading fare, I have to say that this one kept me on my toes as the action progressed and that overall, I really found it a fun and exciting read. If you're looking for something different in terms of thriller and suspense, you'll find it here, especially if you're also interested in America of the 1960s. I'd be very willing to give this author another go when I feel the need for a fast-paced thriller. Nancy - I'm not usually one to reach first for a thriller either. But this one might very well be an exception. I like the context and the mystery. And that time of history is fascinating to me. Thanks for this. This sounds like a good thriller. If you're interested in the student movements of the 1960s in the U.S., and those who went underground, you might read Bill Ayers' fascinating memoir Days of Rage. I sympathized with his sentiments and beliefs, being adamently anti-war and pro the Civil Rights movement, but not with his tactics, not going underground, not "bombings," although what really happened isn't clear. If people who are just protesting have to go underground, like in 1930s Germany, that's different. That was survival, and whatever people had to do to survive and try to stop the Nazis was probably justified, i.e., the opposition inside Germany and the partisans in Europe. And I'd say that was true in the anti-apartheid movement in South Africa, where activists had to go underground to survive or flee and protest from outside the country. And it was true in my grandparents' time in czarist Russia, where people protested in many kinds of ways, and had to go underground to survive. That's what really got my attention -- the time period. And while parts of the book verged on the edge of farfetched, the way he goes about describing life on the run, the times themselves and the divide in this country are incredibly well done. kathy: I'll definitely check out Days of Rage. You might want to read Subversives, by Seth Rosenfeld -- amazing book! I hope to see what you think of Days of Rage. I was an activist in that period, but above-ground, in mass protests, and I'm always interested in reading other people's experiences, though I may differ in overview, tactics and actions. The only book title I can find by Ayers is Fugitive Days -- is that what you mean?